Take your Edison EdVenture into coding and robotics to the next level with EdCreate – the Edison robot’s creator kit. 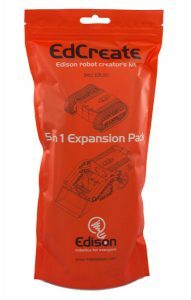 This 5-in-1 expansion pack construction system is designed to work with the Edison robot. Each kit consists of 115 interlocking building blocks, pegs, gears, and other parts. The individual pieces are designed with studs and holes which are compatible with Edison robots and any other LEGO brick compatible building system. This product contains one complete EdCreate kit. Edison robot is not included with the EdCreate kit. The EdCreate maker kit is a construction system consisting of 115 interlocking building blocks, pegs, gears, and other parts. This system can be used with Edison robots to complete five EdBuild projects and a range of open-ended STEM challenges. These free, downloadable resources can help you get the most out of your kit. further information on using the kits in the classroom environment.